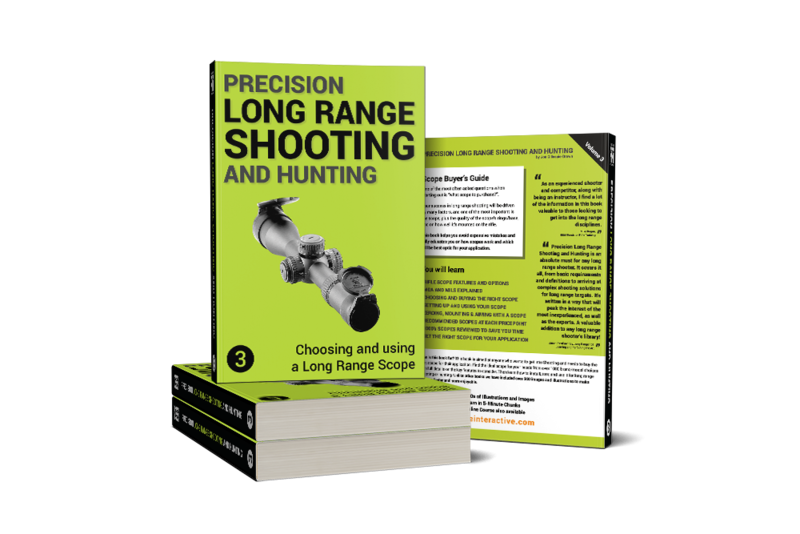 This list is the baseline for long range shooting, as they offer great value and are great starter scopes. They get the job done for a general target shooter, but they are not good enough for a competition shooter. 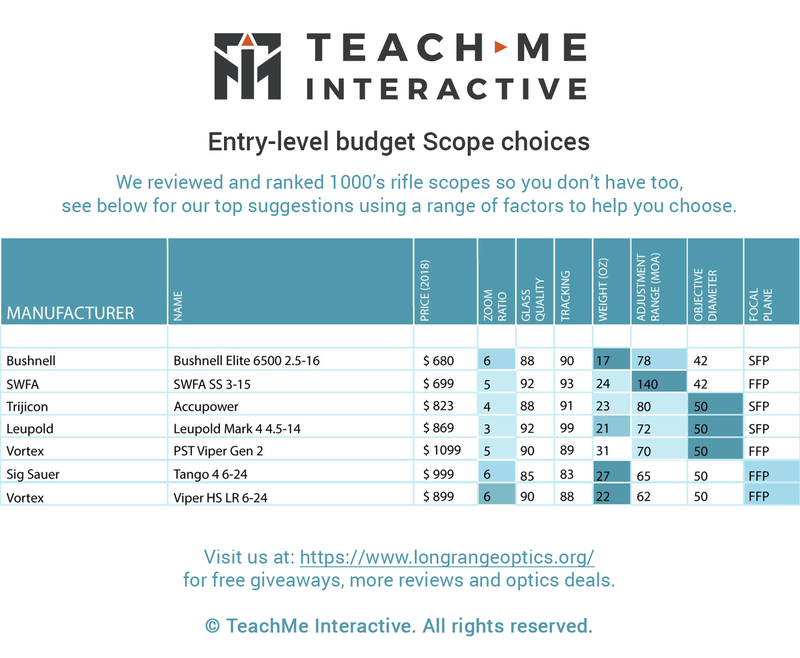 There are a huge number of scopes in this category, these are a few worth considering, but there are likely others that would also suit this budget range. Bushnell Elite 6500 2.5-16: Bushnell is a great name in hunting scopes, the high zoom ratio allows a wide range of uses at the cost of clarity and image blur at high ranges. SWFA SS 3-15: The SWFA Super Sniper is competitive with more expensive optics because of how well it does mechanical precision. Optical clarity is about on par for the price level, reticle and FFP are great for shooters looking to buy a solid mid-priced optic. Trijicon Accupower: Trijicon is best known for its ACOGs. This is a middle of the road scope with SFP and limited reticles. Leupold Mark 4 4.5-14: This scope is an older design with SFP but otherwise a solid scope choice. It has very large turrets and smaller objective lens but is battle tested and well regarded. The question on this scope might be: how long will it be around? Vortex PST Viper Gen 2: The most popular scope for entry level into Precision Long Range shooting. Vortex is a great company with a great warranty. Solid tracking, FFP reticle and a ton of reticle options at a good price. Good quality turrets, solid quality scope with all the base features. Sig Sauer Tango 4: This is a modern and fully featured scope made in Indonesia. It has a unique grey coating, and nice tactile turrets and FFP. Locking turrets, illuminated reticle and solid feel. 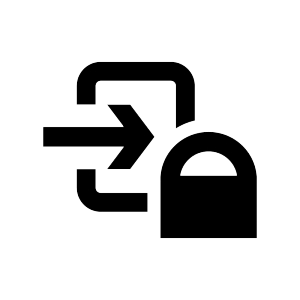 This is fairly new at the time of writing so not as much community feedback, so the long-term reliability is an unknown. Vortex Viper HS LR 6-24: The Viper PST's little brother, lighter with different reticles and a capped windage knob, great for hunters and Long range shooters. Feels lower quality, big turrets and older in design than the Viper. •	ATN X-Sight 4K Pro 5-20x Day/Night ($799): This is a modern take on the scope with a ton of features, reticles and a night sight option. While it is not like the other scopes in the list if you want a cost-effective start in night shooting, or to use the built-in ballistics and ranging while easily recoding your shots, but it’s an interesting option. •	Hawke Sport Optics Sidewinder FFP 6-24x56 FFP ($539): Interesting options to switch out turrets, British designed but made in China. Very long, very large lenses, with interesting wheel design for the parallax adjustment. •	Nikon BLACK FX1000 6-24x50SF FFP ($799): New optic not available to review when writing this article, appears highly featured with good glass for the price. Finally a Nikon with FFP. •	Burris Veracity 5-25x50 FFP ($899): This is a mid-range and lesser known Burris scope, it has FFP and good glass for a reasonable price. It doesn’t have illumination but is well reviewed and has the basic features for long range shooting. •	Hi-Lux Leatherwood ART M1200 FFP 6X-24X ($595): Interesting history and pedigree. Known for their Leatherwood Automatic Ranging Trajectory (ART) CAMputer system technology.